We went from colds and sickness from funky weather to flippin' 90 degrees today! Holy hotness, Batman! I truly wouldn't mind except it almost makes you NOT want to be outside. I could take it, but after 20 minutes the Mini is melted and the K-Man could go all day. I took naptime today to set up the pools. Now to be clear, I mean 1 great big blow up pool and 1 hard-sided babyish pool with a slide. Not exactly your in-ground oasis, but sufficient for kids under 6. The water is pretty cold from the hose, but I don't think it will take long for it to warm to a comfortable temperature today. 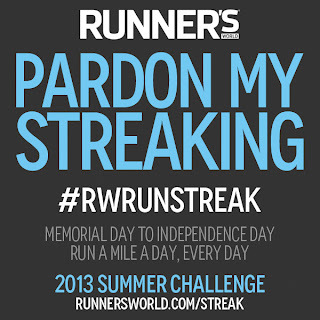 Because I am Streaking, Baby! Gotta get in at least 1 mile! Have a hot and happy weekend!